The RAWCS Eastern Region quarterly meeting held in Orange on 12 November 2016. The Rotary Club of Berrima District received the grant for their “Tara Ed. Teacher Training and Rural Schools Assistance” project in India. This project was designed to increase the quality of education in rural schools in Maharashtra State, India through teacher training and by providing basic teacher and classroom resources, sponsorship of school fees, equipment and uniforms for 50 underprivileged girls. John Macpherson who is the Project Manager for the project was presented with a certificate for the $1,000 grant which will be transferred to this RAWCS project. Since its inception in 2009, Tara.Ed has made an enormous and beneficial impact on 28 schools, 350 Indian teachers, and 50 Australian teachers and over 8000 children. Next year the Rotary Club of Berrima District and Tara.Ed will host six Indian teachers to expose them to Australian teaching methods and conditions in Bowral and Goulburn. If you’re interested to learn more about the project please contact the Project Manager John Macpherson greymac@acenet.com.au or if you wish to make a tax deductible donation via RAWCS visit the link:https://donations.rawcs.com.au/Default.aspx?ProjectID=712&ReturnTo=4 The Rotary Club of Gungahlin also received the grant for their “Play and Learn – Early Childhood Development (ECD)” program in Timor Leste. Congratulations to Berrima Rotarian John Macpherson for his hard work and dedication to our RAWCS projects. Hearing young people’s stories from Triple Care Farm brings home the important role we all play in helping youth in crisis. Rotary has has had a long association with Triple Care Farm through the construction and maintenance of Rotary House on the property. This facility is used for short-stay accommodation when friends and family visit the farm. Levi, who’s story is in this newsletter, has overcome ice addiction, reconnected with his family and is now working full time – all because your support enabled him to go to Triple Care Farm. Ice ravages young lives. Below you will find a link to a short video which will help you to learn how Triple Care Farm has addressed the ice epidemic. I encourage you to take a few moments to view the clip. And find out how your support saved Levi’s life. To make a gift today to support of the 31 young people waiting for a place at Triple Care Farm in 2017, simply email me at a.green@sdmf.org.au. 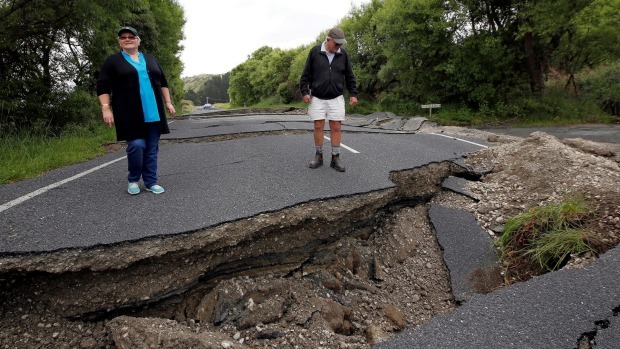 A National RAWCS NZ Earthquake Appeal has been set up to assist the disaster in New Zealand. The advantage of this process is to allow Rotarians and friends to obtain a tax-deductible gift receipt, and to ensure all donors only need to donate into the one account. The Project partner is the NZ RAWCS equivalent Rotary New Zealand World Community Service (RNZWCS) and we will regularly release funds into their account set up to support the NZ Earthquake needs as required. 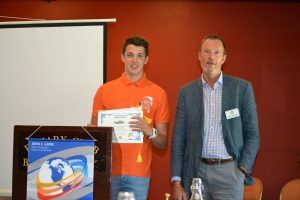 Thank you to Rens Traets, the current inbound Rotary Youth Exchange student in the Southern Highlands, who was our meeting guest on the 16th November. Rens has just turned 16 is comes from a small harbouside town in the Netherlands. He is finding the Highlands very beautiful though a little quiet. He is looking forward to heading to the beach with his current host family over Christmas. 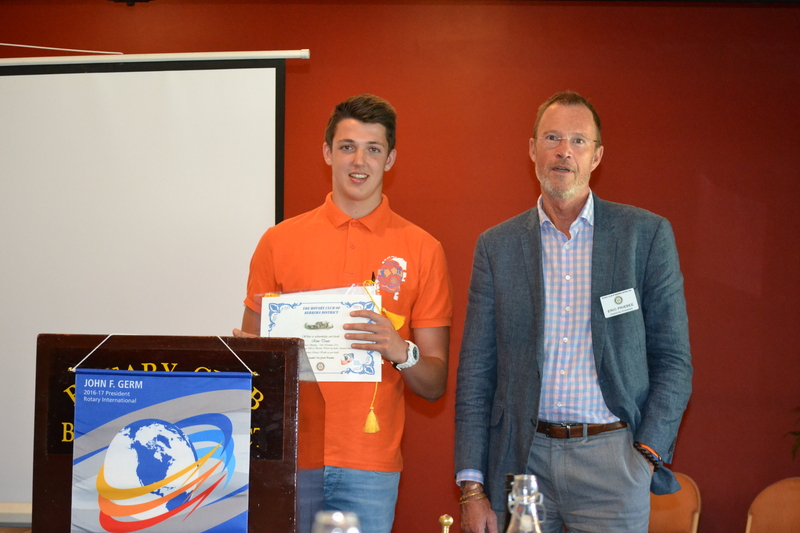 Berrima Rotarian, Eric Priebee, presented the Rotary banner to Rens after a short speech in Dutch. What is RYLA? RYLA is an acronym for Rotary Youth Leadership Awards. It is a leadership program coordinated by Rotary Clubs around the globe. Each year, thousands of young people participate in this program. Young people ages 18 to 25 are sponsored by Rotary Clubs to attend the event run by the club’s district committee. Participants are chosen for their leadership potential. Rotary Clubs and the Rotary District cover all expenses for the participants. The format of the event vary from district to district, but commonly take the form of a seminar, camp, or workshop to discuss leadership skills and to learn those skills through practice. Rotary clubs and districts select participants and facilitate the event in conjunction with past attendees of RYLA to create a peer guided experience. The District 9710 RYLA experience consists of a 6 day residential programme held in the ACT every January. On the 9th November we had the pleasure of listening to our club’s candidate Jade Chapman express her excitement about the upcoming programme and tell us a little bit about herself. 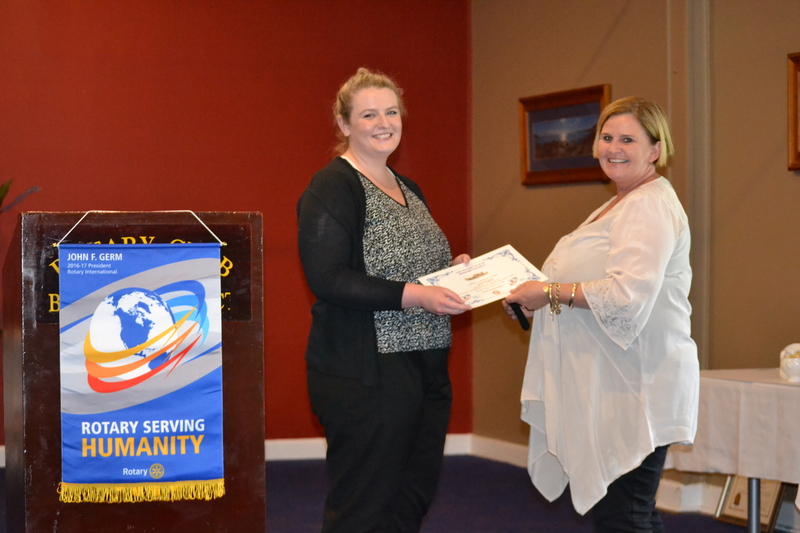 Jade is currently undertaking a Bachelor of Commerce, majoring in Accounting, at the University of Wollongong. She hopes one day to become a partner in an accounting firm. We look forward to hearing the impact that RYLA has had on Jade when she return in 2017 to tell us all about her experience.